MSR Thru-Hiker Mesh House 3. Weighing a mere .46 kg (1 lb) this ultralight and ultra-packable shelter is ideal for thru-hikers and long-distance backpackers on extended trips in the backcountry. It delivers all the essentials: excellent ventilation, bug-free protection, and space for three backpackers—or extra room for two. 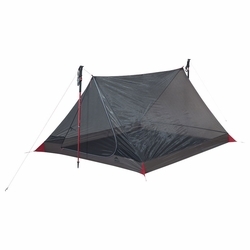 Use the Mesh House on its own for maximum ventilation, or pair the shelter with the Thru-Hiker 70 or 100 Wing (sold separately) for added wind and rain protection. Whatever the trip or conditions—marshy meadows in the Sierra Nevadas or thunderstorms in the Cascade Range—this highly adaptable shelter system lets you choose the weight and protection you want. Ultralight: Minimum weight of just .46 kg (1 lb) when you use your trekking poles for setup. Livable Space: Floor plan accommodates 3 camping pads plus gear. Micromesh Protection: Micromesh canopy provides maximum ventilation, moisture control and bug-free protection. Added Production: Pair with a compatible Thru-Hiker 70 Wing or 100 Wing (sold separately) for versatile protection options. Trekking poles and Thru-Hiker Wing sold separately. Wind and rain protection for smaller groups. Custom-fit protection gives your tent floor some TLC.